Delush Polish Garden of Thorns is described as “A deep gemstone emerald jelly featuring a devious glitter mix, accented with touches of pink that is sure to bring out your feisty side.” I do believe this color was inspired by House Tyrell. 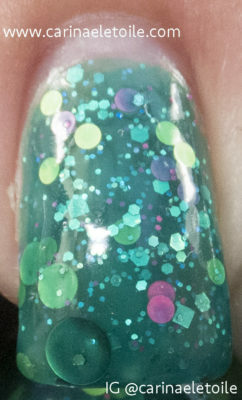 This is a gorgeous, jewel-toned green with some lovely glitter with a pink thrown in that goes quite well. No spoilers here from Sunday night’s Game of Thrones episode which happened to be the season finale…but it was satisfying. Did you watch it if you are a fan? I’m a bit sad I have to wait a year, but 2017 should be a bittersweet year as well. One of my favorite tv shows, The Americans, is ending. Have you watched it? No? Give it a shot. It’s spell-binding and is just as good as Game of Thrones. 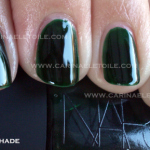 Now, back to Delush Polish Garden of Thorns – it’s a polish that goes on like buttah and is multi-faceted. Application was easy-breezy and one that I wish most glitter polishes possessed. Below is what the color looks like in two medium-handed applications. Where can I find this gorgeousness? Please remember that if you want to see a bigger image, click on the thumbnail to enlarge it to a larger size. Now that you’ve seen this color, would you want it int your collection? I feel the entire Dames of Thrones is one that should not be missed. This is so squishy and delightful. I love how deep the glitter looks in this. So pretty! I think I am one of the few who never watched GoT. However this polish is gorgeous! Round glitters always get my attention for some reason. That’s such a pretty shade. Everything from the teal base to the circle glitter is perfect!